We’re always getting questions from readers and today I thought we’d revisit a question from an earlier post. I’m sure some of you have had the same question as you’ve begun learning how to wire wrap. Question: How do I prevent scratches on my cabs when I adjust the top wire on pendants and rings, such as the Pharaohs Ring? Answer: There are three basic guidelines that can prevent scratches on your cabochons while locking them into a frame or setting. 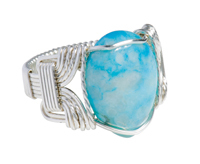 Never use a twisted wire as the wire to pull over the top of a cabochon. Be sure you have used enough wires for a cabochon frame, because having to reach down with a tool and pull a wire up and then bend it over a cabochon can scratch the cab. Practice your cabochon ring and pendant frames using stones with a Mohs hardness of 6 or more, such as quartz, jasper, and agate. When you are more confident with your tool techniques, then move on to softer stones such as malachite. 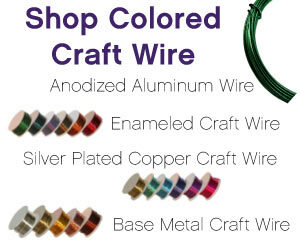 If you’d like to learn how to do more extensive wire work, take a look at our selection of Wire Jewelry Books and Instructional DVDS. We have many plenty choose from. 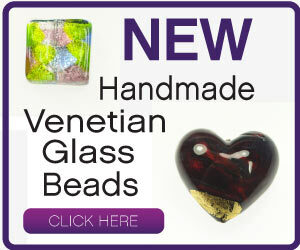 Do you love this information- why not sign up today for your FREE Jewelry Making Patterns. It’s a great place to start! I love your helping suggestions to help us be better jewelers. I was wondering what the stone is in the Pharaohs ring. It is very pretty. Is it from this website? I’ll be reading more tips, thanks again.